For professionals working with people who experience severe psychosis, increasing empirical evidence for the benefits of psychotherapy for psychosis has been especially welcome. Given the limitations of medication-only approaches and the need for an expanded perspective, including for those diagnosed with schizophrenia, Surviving, Existing, or Living takes a fresh look at severe psychosis, offering a heuristic model for understanding psychosis along a continuum of severity, from the extreme experience of acutely impairing psychosis to a more enriched life experience. 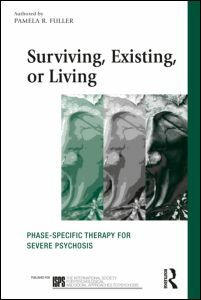 Surviving, Existing, or Living examines the rationale for these three phases, and provides details of phase-specific treatment interventions as well as a ‘how to’ guide for facilitating engagement and for determining ‘what to do when,’ including with those experiencing acute, severe psychosis. Rich clinical case examples are provided to highlight concepts and the types of interventions. Trauma-specific and group interventions for psychosis are also described, as well as ways to foster resilience in the professional who works with individuals with psychosis.